Goosebumps. 2015. Directed by Rob Letterman. Screenplay by Darren Lemke from a story by Scott Alexander & Larry Karaszewski; based on the novels by R.L. Stine. Starring Jack Black, Dylan Minnette, Odeya Rush, Ryan Lee, Amy Ryan, Jillian Bell, Ken Marino, Halston Sage, Steven Krueger, Keith Arthur Bolden, Amanda Lund, Timothy Simons, and Karan Soni. Columbia Pictures/Sony Pictures Entertainment. Rated PG. 103 minutes. As someone who grew up reading all of R.L. 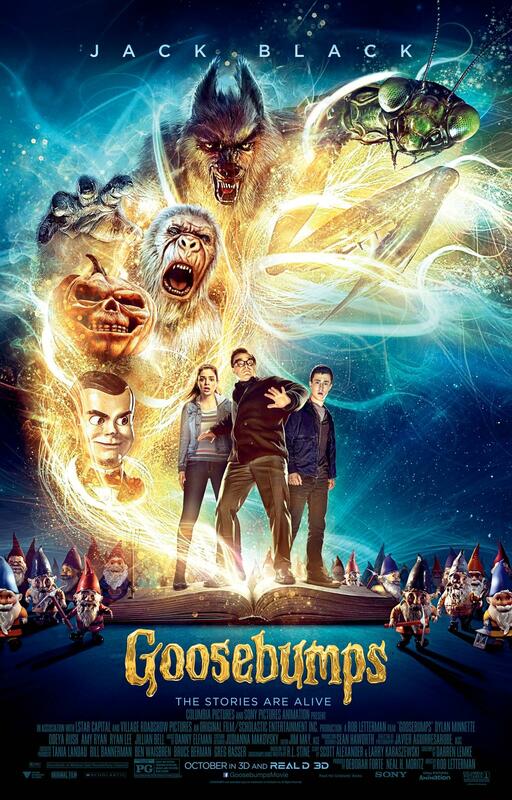 Stine’s Goosebumps series, I was more than happy to go to the theatre with my dad and my little stepbrother today and see the new Rob Letterman-directed adaptation; in 3D, no less. For many of you that have been around my site before, you’re aware I’m a big fan of horror movies. I attribute part of that love to Stine. There are way too many instances in his novels where I found myself creeped out. Even after getting into them, reading any one I could put my hands on, I’d always come across another story that would frighten the life out of me just as I thought I’d become accustomed to Stine’s scares. He was always a consistently imaginative and slightly scary type of author. A favourite of mine was always The Haunted Mask, which shows up briefly in the film. While I’d actually love a more horror version of Stine, this adaptation of Goosebumps was still a lot of fun, as well as the fact it’s definitely something your entire family can enjoy. Predominantly a comedy, there are plenty of the Stine monsters here with several fan favourites, and Jack Black certainly plays the author himself with youthful vigour. One of the greatest parts of the film is the acting because the kids and adults seem to have a blast. And even as a horror fan, I still thought there were a few creepy moments calling back to Stine’s books. It really made the nostalgia inside me flare up remembering all those spooky nights laying in bed with one of his haunting stories. When Gale (Amy Ryan) and her son Zach (Dylan Minnette) move to the – fictional – town of Madison, Delaware, their life starts to get more exciting, or possibly more frightening than ever before. Settling in, Zach discovers the next door neighbours are a little odd. Well, Hannah (Odeya Rush) seems to be lots of fun. She and Zach bond almost immediately. But it’s Hannah’s father, Mr. Shivers (Jack Black), who is the rough and jagged personality in the house. After Zach believes Hannah is being kept captive against her will by her father, he calls the police. After they bumble around and do nothing, Zach – with the help of silly sidekick Champ (Ryan Lee) – sneaks into the house to try and rescue Hannah. But what comes next is unexpected. Inside the house, Zach accidentally releases the monsters from a set of locked books…. belonging to none other than R.L. Stine. The supposed Mr. Shivers is really the Goosebumps author hiding out, trying to live a normal life. Because what is in the books has come alive, each and every monster Stine ever dreamed up in the course of his life now roaming the streets. Then there are the younger actors, each giving it their all in respectively fun roles. Dylan Minnette played Zach well and very believably, which played well off the skills of Odeya Rush. These two were good together, as well as apart. Mainly it’s the subplot of Hannah (Rush) which makes their dynamic work so well; they’re a real and genuine pair of teenagers embedded in a highly supernatural situation. On top of their talents, young Ryan Lee does a fantastic job with the Champ character. While there are all kinds of cheap jokes and real cheesy ones, as expected in a PG film especially, I found Lee made me laugh out loud. There are moments with him and Minnette where they had me cracking up, from big laughs to more subtle bits. These three actors added to the energy of Black as Stine are one of the major reasons Goosebumps is enjoyable, despite its flaws. All the monsters included were extraordinary. Keep in mind, I did see this in 3D, so a certain amount of why I loved the big flashy stuff is because of this reason. I’m not usually huge on CGI, much more a big fan of practical effects. But all the same, the way this film used the monsters it played out like a light-horror disaster movie – in undeniably exhilarating fashion. The werewolf is one of my favourite creatures. Also, the ghouls are amazing! When they started to break through the cemetery ground, grabbing at the kids and Stine, I was creeped out and pumped at once. Really brought in a nice dose of horror. Again, while this isn’t exactly horror there’s still plenty of that aspect out of Stine’s novels here. It isn’t savage or anything, not by a long shot. Yet it’s spooky at certain times, and of course infused with action. The abominable snowman sequences, especially early on, were too fun and suspenseful. It’s almost like the larger the creatures/monsters get funneling off the page, the more wild and enjoyable the film gets. This isn’t always the case with monster movies, but the way all of Stine’s monsters converge on the tiny Delaware town is really well done and goes to show how the screenplay is written with a lot of thought given towards honouring Stine. My only complaint about the monsters? Not enough Haunted Mask. A little shoutout, just wasn’t enough for me. This is certainly a 3.5 out of 5 star film. I had a lot of fun in the theatre watching this; a huge film fan, I’m not particularly fond of seeing movies in theatre honestly because people bother me with their ignorant stuff. More than that, 3D usually makes me feel sick after an hour. 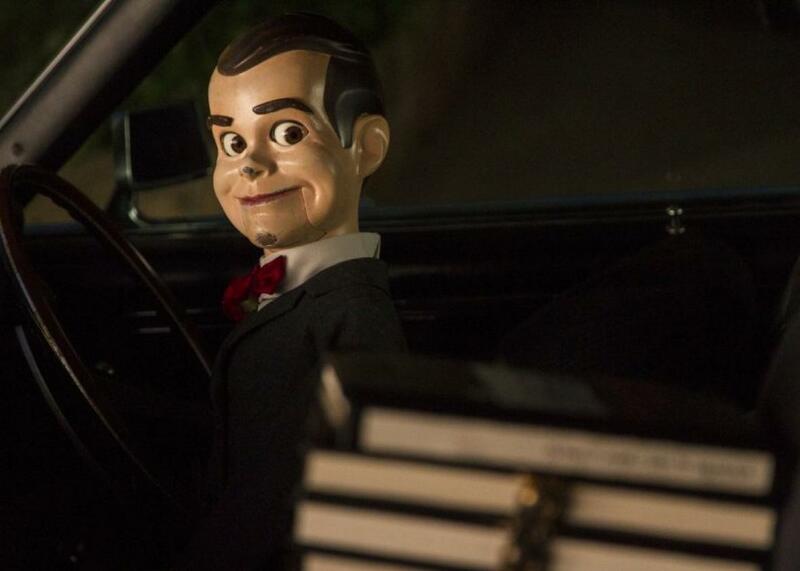 But this Goosebumps film adaptation wrapped me up in its unbridled fun, almost right from the beginning, and the nostalgia it offered was almost enough to sell me on the whole thing. While I did find the script could’ve went for more creepiness and done away with some of the super cheesy portions, overall I found the screenplay really kept the heart of Stine, in many ways, and the characters were rich enough I forgot most of my gripes by the time the film ended. If you’ve got some young ones around, I would totally suggest taking them out to see this before Halloween. Nice movie for the family and if you were an R.L. Stine fan/still are, you owe it to yourself to go see this fun flick.